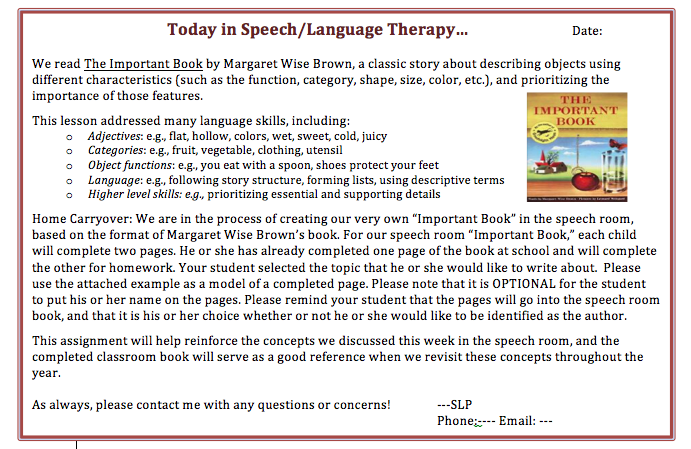 It has been such a whirlwind getting ready for my FIRST YEAR as a SLP! My room is coming together (I'll be posting pictures soon) and I'm feeling excited (and nervous!) about the kids coming next week. My blogging schedule is going to be a bit thrown off for the next few weeks, so please bear with me as I navigate new the challenges ahead! I often find that the students have a difficult time with basic semantic skills such as categorization, identifying object functions, and using adjectives. These deficits can really hinder their expressive language skills. It became clear to me during a game of HedBanz (if you don't have this game yet, you MUST get it!) that the students have no idea where to start and tend to make seemingly random and inefficient guesses that are resultant of having a poor understanding of semantic relationships. For example, in the HedBanz game, each child places a card in his or her headband without looking at it. The cards depict many different things - animals, food, tools, vehicles, etc. The goal of the game is to ask the other players yes/no questions to help determine what is on the card. Despite lots of modeling and coaching, I have had countless students begin their questioning with too narrow of a focus rather than starting with a broad category, "Is it a turtle?" vs. "Is it an animal?" Clearly we need to do a lot more work on understanding semantic relationships! I originally purchased The Important Book (by the way, you can swipe your copy here ) because I wanted to find a tool to help teach my students to differentiate between salient and extraneous details. I really love the repetitive quality of this book and the illustrations are great too. However, after flipping through the book, I quickly realized that some of the descriptions highlight what I would consider to be the "details" rather than the "main idea." 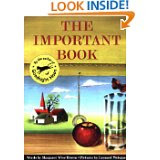 For example, the book cites the most important thing about an apple is that it is round. Grass? It is green. A spoon? You eat with it. Hmmm.... I was a little bummed about this and was about to bag the lesson idea when I realized that it might actually be a great opportunity to foster some debate and discussion amongst my students! So that's how I've decided to use this book. After we've had some extensive instruction and practice with categories, I'll bring out this book. I'll read the whole book, pausing every couple pages to ask students their opinion about whether they agree with the author or if they have a different idea about what the most important part is. After we finish the book, I'll refresh the concept of categories ("A category is a group of things that have something in common. They are all alike in some way.") Then I'll point out that the author didn't use very many categories in her descriptions, even though we know that the category is a very important word to use to describe things. So I'll flip back through some of the pages and ask the students help the author think about to which category each object belongs. "Let's say I'm going to make my page about a dog. What is the most important thing about a dog? What category does a "dog" belong to?" "Okay now let's think of some things about a dog. Tell me what a dog looks like. Tell me what a dog does. Anything else we know about dogs?" "Great work, friends. I love how we put that important category word first - A dog is a _______. Mmmhm. 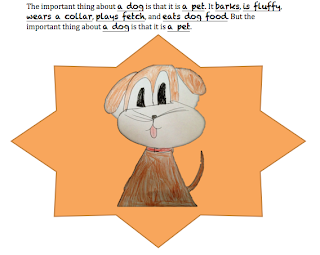 And after the important category word, we thought about some other details to describe a dog. Great job!" After we've finished doing the example together, I'll have the student works on their own pages. I'll give them one to do in the group session, and one to take home for homework. We'll brainstorm what they should write about and fill in that part together, just so I can be sure they aren't all picking the same thing or choosing something that would be too difficult. 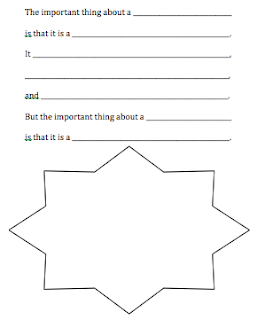 I've made up a letter for parents to explain the lesson and the homework. 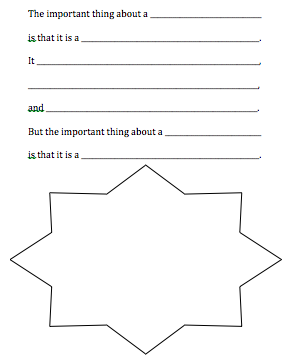 Grab your copy of the letter here, as well as the in-class activity/homework. Unexpected surprise: I learned today that I have a huge bulletin board outside of my room that I'm responsible for maintaining! 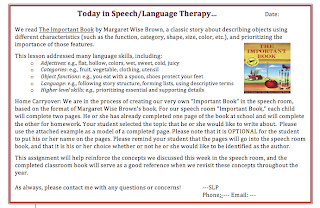 I plan to use this activity and some of my other literacy-centered activities to display since they usually result in a concrete product, unlike some of the other drill-based activities we do in speech. After I take the pages down from the board, I plan to bind them and keep the book in the classroom for the kids to use as a reference. Pictures to come! Have a great week getting your classrooms set up! Drink coffee, eat chocolate!